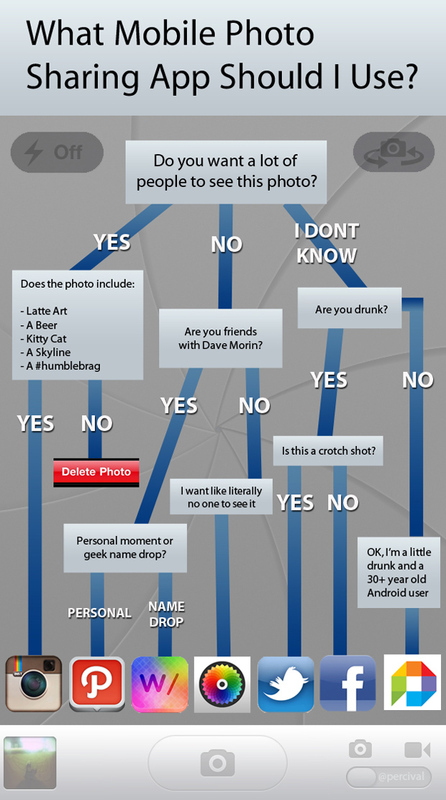 What Photo Sharing App Should You Use? Well who isn’t building a photo sharing app these days? At this point I honestly wouldn’t be surprised if Google came out with its elaborately named attempt like tomorrow. But seriously, with such a glut in the mobile photo sharing market, it’s pretty hard to choose a vehicle with which to share your precious terrible photos. Never fear dear readers! Internet humormonger Sean Percival and I have come up with the above handy flow chart to help you figure it out. Still in doubt? Just use Instagram like everybody else.